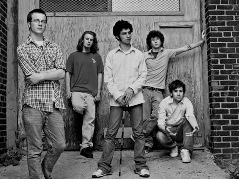 PROTEST THE HERO today announces their Fall 2008 US tour. The Whitby, Ontario quintet will be main support for Unearth on a twenty-six-date tour that begins October 1 in Baltimore, MD and wraps in New York City on October 30. Protest The Hero is touring behind their sophomore Vagrant release, Fortress (1/29/08) and is currently midway through their summer run on the Vans Warped Tour. See all dates below. "We have always enjoyed and respected the music that Unearth create so it's a relief to finally be touring with a band that we care to watch," says vocalist Rody Walker. "On top of that we haven't been touring the States too extensively in the past few years so it will be nice to be back for a legit tour� if not for the smokes and cheap booze alone." On August 5, the band will release the Sequoia Throne Remix EP exclusively on iTunes. The three-track EP features three remixes of the band's current single created by three very different artists; C0ndu1t, L-Ion, and Devin Townsend. In September, PTH will be shooting a new video for "Palms Read" in Toronto with director Sean Turrell (Billy Talent, Tegan and Sara). Protest The Hero is: Rody Walker (lead vocals), Luke Hoskin (lead guitar, vocals, piano), Arif Mirabdolbaghi (bass, vocals) Moe Carlson (drums), and Tim Millar (guitar, vocals).